Snow storms can leave you stranded for days, and if something like a power outage would happen, would you be ready with the necessary supplies to keep your family safe and warm? 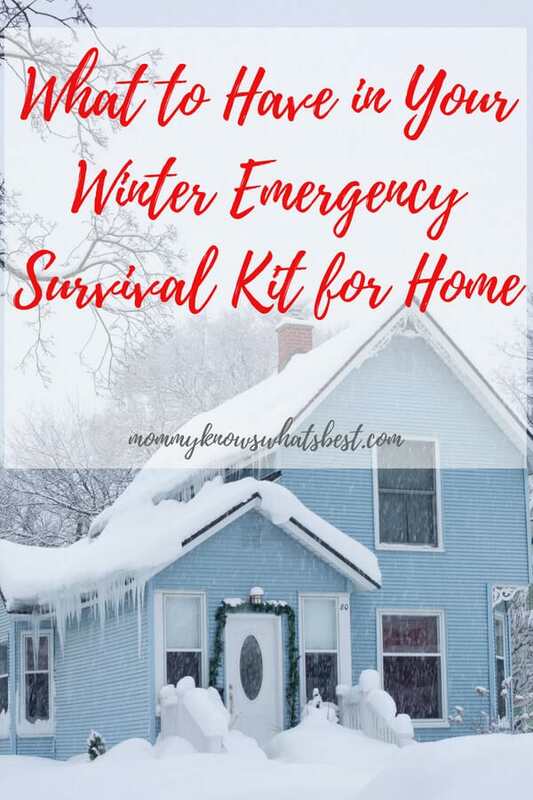 If you live in an area where winter storms are common, it would be wise for you to have a winter emergency survival kit ready to go for your family. First aid kit: sterile gloves, band-aids, cloth bandages, antibiotic ointment, eye wash, thermometer, pain reliever, antacid, scissors, tweezers, etc. You can even keep first aid kits in the car. Flashlight or lantern: it may be wise to have several flashlights or lanterns on hand, plus extra batteries. Food: three day supply of non-perishable food. Try to choose healthy foods, like tuna, peanut butter, granola bars, nuts, dried fruits, canned veggies, individually packaged cereals, etc. You can also store powdered milk. Chips and candy are not going to keep you healthy and satisfied during an emergency! Don’t forget a can opener for those canned goods. Extra blankets and clothing: if your heating is electric, your house is going to get cold. If you can store a few extra sleeping bags in/near your kit, that’s be great. Also store winter hats, gloves, socks, and scarves. Garbage bags: for garbage, sanitation purposes, or to put on feet before putting boots on to go out in the snow. Paper towels and wipes: for sanitation and clean up. Matches and candles: if necessary, you can light some candles for light. Do not keep candles lit while sleeping! You can also build a fire outside to cook food. Scroll down to get a free checklist! During a winter emergency, it’s wise to know how you’re going to stay warm until your power or heat source returns. The number one thing to do is to dress warmly. Throw on some extra shirts, sweatshirts, pants, socks, and coats. Since heat escapes from your head and hands as well, put on a winter hat and gloves. To make it fun and perhaps less frightening for the kiddos, set up a small tent in a room or build a fort. The tent/fort will help keep in your body heat. If you have a wood burning stove or fireplace, certainly use them to create heat. Don’t try to use kerosene heaters or any other kind of outdoor heaters. They can produce deadly gases such as carbon monoxide. In a small room, lit candles may produce some heat, but do not leave them burning when you are sleeping! Due to ice on power lines or severe winds, power to your home may be lost for some time. Two of the most common sources of light during a power outage are candles and flashlights. Have you ever thought about using a lantern? Lanterns are great to use as sources of light during power outages. Not only do they provide more light than a traditional flashlight, their bulbs tend to last longer. Plus, there’s no need to worry about any candles catching your house on fire. What’s In Your Winter Emergency Survival Kit? Tell me: do you have a winter emergency kit? What is in it? I’d love to hear from you! 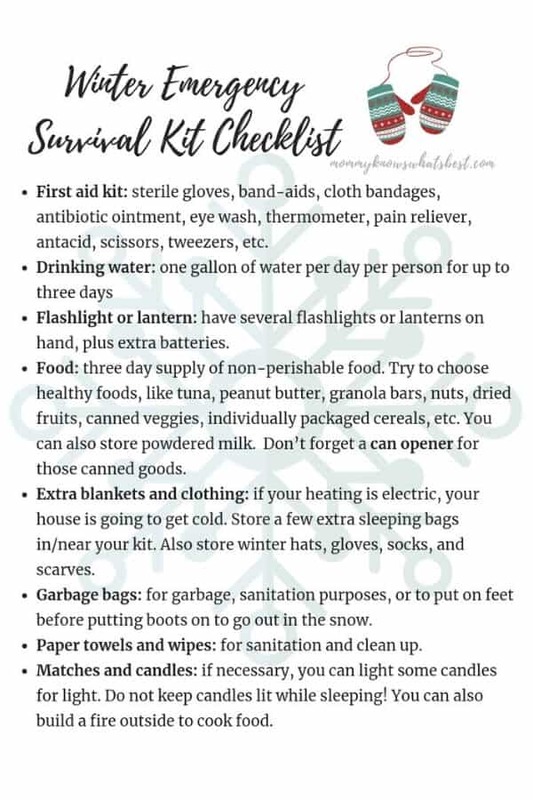 If you need a full emergency survival kit checklist, you can get a FREE printable checklist here. This is a great blog. You never know when something will happen. You gave some good tips. Love the picture of the kids. This is such a helpful list. I have to share this! These are really helpful suggestions! Thanks a lot for posting this list.